This week in the war, on 7 April 1943, Adolf Hitler and Benito Mussolini met in Salzburg to discuss the military situation. Axis forces had suffered major defeats and were on the defensive both in Tunisia in North Africa following the Battle of El Alamein, and in Russia after the surrender of Paulus’ army at Stalingrad. 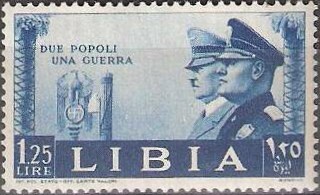 Mussolini asked the Fuehrer to sue for peace with the Russians, thereby freeing up forces that could be transferred to southern Europe and North Africa. The Duce realized that Italy was about to lose its empire in Africa and probably the war. Hitler wasn’t interested in peace. He spoke enthusiastically about future victories and swore that North Africa would be held. 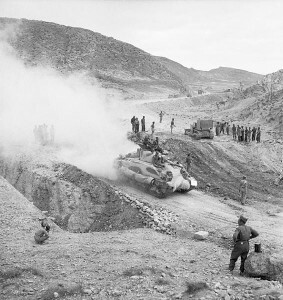 He vowed that Tunis, in particular, would be defended just as Verdun had been resolutely defended by the French in World War I.
Ironically, on that same day, 7 April 1943, the American First Army’s II Corps advancing east from Gafsa linked up with the British Eighth Army’s X Corps moving northwest from Gabes. The Americans and British in Tunisia had joined forces. Their march would continue and the capital, Tunis, would be their prize. This entry was posted in World War II and tagged Hitler, Mussolini, Salzburg, Tunisia. Bookmark the permalink.